Beauty and function on the inside. Organization need not be boring. By: Becky Carico, Assistant Marketing Communications Manager at Häfele America Co. When it comes to organization, everyone could use a little bit of help. 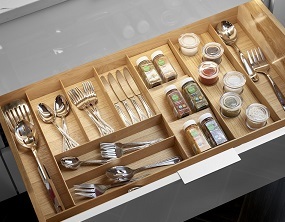 Turning a bare drawer box or pantry shelf into something entirely functional, stylish and immeasurably personalized is exactly what Häfele’s range of Fineline™ products is all about. For your next project, adding that touch of Fineline could be just what your design needs. 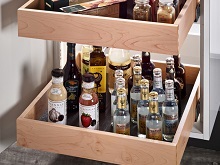 Let your customers add a personal touch to the kitchen, bath and other spaces with our five wood finish options of Fineline Drawer Organization products—birch, walnut, white oak, mahogany and cherry. An elegantly designed favorite, Fineline features tapered lines and a contemporary, high-end look. Carry over the design. Organize it all. 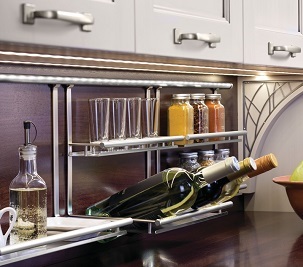 With your choice of walnut or birch boxes paired with silver or champagne brackets, Fineline Kitchen Accessories create a contemporary, high-end look for some of the market’s most popular pull-out’s including the Magic Corner I and Magic Corner II base blind cabinet solutions, the Kesseböhmer Pantry Pull-Out and the Kesseböhmer Base Pull-Out II. Organizational needs change. So do we. When it comes to in-drawer organization, the modular Fineline Move is a selection of flexible trays, dividers, boxes and holders to support wider and deeper tray sizes. Regardless of drawer dimensions or depth, Fineline Move is designed to fit your exact specifications. A pantry this good deserves accessories to match. 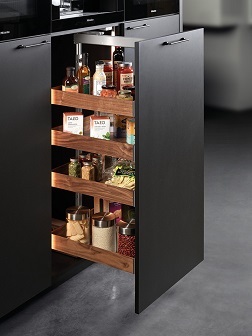 Taking kitchen organization to a whole other level is Häfele’s Fineline LAVIDO . 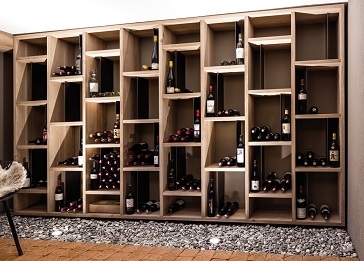 Crafted specifically for the Lavido pantry system, Fineline Lavido brings a system of dividers, plate racks, wine holders and other accessories warmly fashioned in fine joinery out of birch or walnut. With Häfele’s wide range of Fineline products you’re sure to find the perfect fit for your next project in the wood finish that your customer is looking for. It's okay to be a little power hungry. Outlets,USB ports and much, much more. By: Scott Kaminski, Marketing Communications & PR Manager at Häfele America Co. The devices you use every day—smart phones, tablets, laptops and more—demand power to run at peak performance. 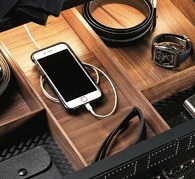 This is exactly why Häfele offers a wide selection of charging options to fit your design, lifestyle and space. Whether it’s for your home, office, hotel or even the underside of a cabinet, we’ve got you and your thirsty devices covered. 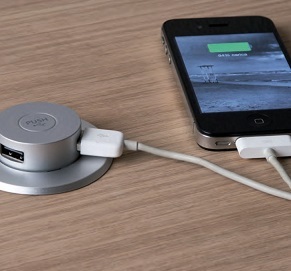 The convenience of pop-up USB ports in your designs cannot be understated. They’re always needed, always appreciated and easily hideaway when not in use. 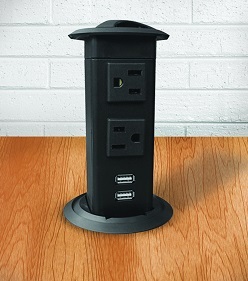 The Pop-Up USB Charging Center features two 2.0A USB charging ports. Charging Grommets can be had in your choice of 120V outlet/2.0A USB charging port or dual 2.0A USB charging port varieties. Both are simple to install in practically any surface and easily bring power wherever you need it most. The combination of multiple outlets and multiple USB ports in one place just makes sense—especially when it’s easy to access, can be moved when needed and comes in your choice of white, black or silver finishes. 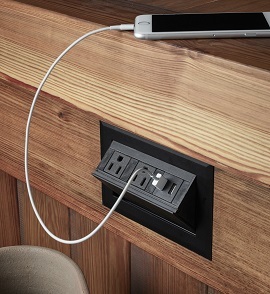 Our Dock 2110 includes two outlets and two 4.2A USB ports. 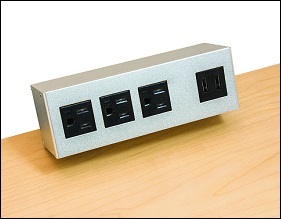 The Dock 3110 expands capabilities to feature three electrical outlets and two 4.2A USB ports. Both look good and keep your devices going. 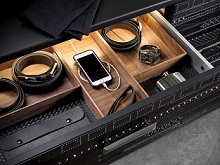 The Docking Drawer family of products allow for a stylishly designed standard or GFCI outlet to be discreetly hidden within a drawer, no matter the room. 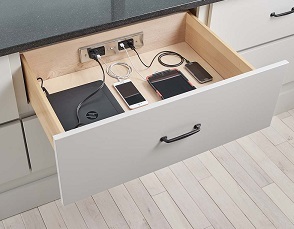 They’re unique design allows you to open and close a drawer without ever needing to worry about damaging the power cord. So if you want to clear clutter in the kitchen—no more phones plugged in on the countertops!—or bring innovation to where your hair dryer lives, this is the right solution for you. 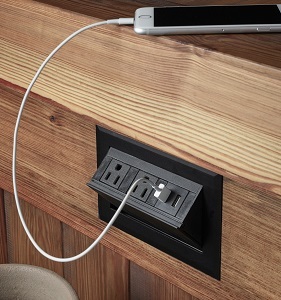 If necessary, you can even get multiple outlets and/or USB ports into one drawer. Power whenever and wherever you need it. An inconspicuous, flat surface when you don’t. Hide-A-Dock from Häfele offers either one outlet with two USB ports or two outlets with two USB ports and discreetly fits into practically design. Its durable construction means you’ll have years of reliable, trouble-free performance and all the power you need. Power stations live in flat surfaces and can be easily accessed when in use and then put away when not needed. Most are designed to rise right out of a countertop or tabletop and then quickly stow away when not needed. They offer a wide range of outlet and USB port configurations which make them ideal for kitchens, living rooms, common areas or even commercial applications. Pick the one which best suits your needs and then get to charging. Häfele’s line of LED Desktop Lamps ensures that you have brilliant, efficient lighting wherever you need it. Some also come equipped with USB charging ports too. So whether you have a need for tabletop light in a home office or business, study nook or workbench, know that efficiency and power will always be there for you. So while we all admit that we need power, there’s never a need to be without power. Now or in the future. When it comes to winning in Las Vegas, stick with us. When it comes to the Kitchen & Bath Industry Show, Häfele always relies more on skill and experience rather than luck. We always display our latest and greatest in a stellar, show-stopping booth. For this years’ KBIS, check out the top ten things to look out for in booth C8916. 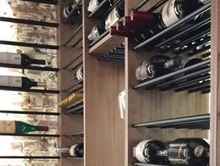 We just recently added three, all-new, easy-to-install wine storage options we’ll be debuting at this year’s KBIS show. Whether your choice is a vintage Syrah or a young Riesling, you can count on it being fashionably organized. 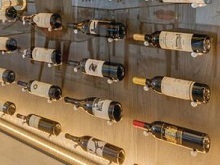 The Wine Post stores and displays wine bottles so the label can be prominently displayed from the front. 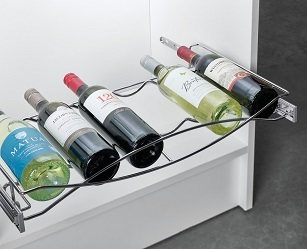 With the Wine Peg you can view wine bottles with a compact, neck out design that fits more bottles in a small space. 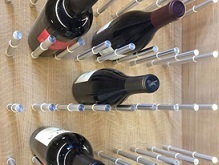 Parallel Rods store and display wine bottles so the label can be viewed from the front while the rods span between two vertical substrates. Häfele’s dECOLeather® Recycled Leather Veneer (RLV) by EcoDomo program allows closet designers to make their organization and storage projects truly custom. This program allows designers to create custom leather doors, drawer fronts, shelves, liners and countertops that are made to exact specification in a variety of unique colors and textures. Durable and easy to maintain, recycled leather veneer is a stylish, chic addition to any project. 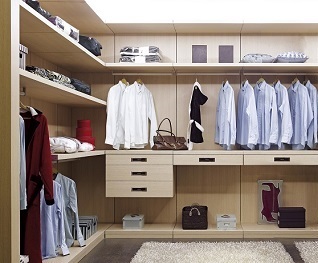 Closets are where we store our most treasured things. And where peace of mind in securing things like jewelry and other valuables is paramount. Designed exclusively for closets, the all-new Digital Keypad Safe from Häfele fits within a standard 18” wide x 14” deep opening. Its interior, fixed shelf offers plenty of storage flexibility. 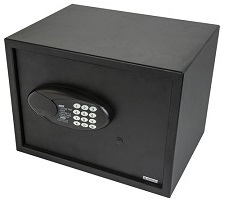 Constructed of durable steel and outfitted with mounting holes so it can be securely anchored to walls or shelves, its electronic keypad accepts customized 3-6 digit access codes as well as an optional master code. Emergency keys are also included in case of battery power loss or forgotten access codes. Something you don’t often find in today’s kitchen that would benefit every homeowner is the all-new Hailo Libero 2.0 Auto Opener . The electronic, hands-free opening mechanism is for practically any base cabinet pull-out. Because sometimes using your hands just isn’t an option. The mechanism operates the pull-out via a foot sensor or with an optional remote control making it ultra-user-friendly. Want it in an existing pull-out? The Libero 2.0 is for base cabinets from 12” (300mm) to 48” (1200mm) wide making it easy to retrofit. It can also be used in face frame applications with the unit blocked out and activated via the optional remote. Users can even customize opening force and other features through an easy-to-use mobile app. Give your designs the perfect touch in the bath, vanity or closet areas with Häfele’s Multi-Dimensional Mirror . 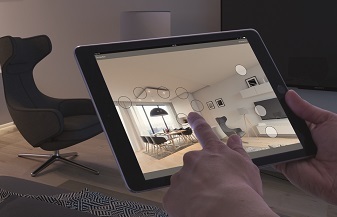 Beautifully designed with integrated touch-keys, the mirror adds value, functionality and style to any project. This versatile mirror allows the user to switch from warm to cool make-up lighting, background lighting which adds accent and personality to a room, and more! One touch activates an anti-fogging function to prevent condensation on the mirror during and after a shower. It also even works as a sound system when linked with any Bluetooth-enabled mobile device. 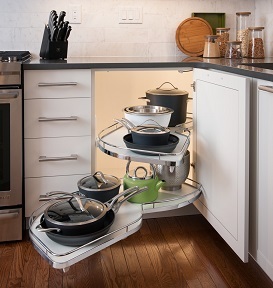 The all-new Tandem Solo allows you to use all of the space inside tall cabinets. 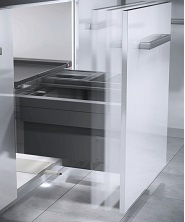 As the door opens, the unit automatically glides forward to provide a clear view of stored items. Because the Tandem Solo is mounted on the side panels and base of the cabinet, this product is an easy fit for all your tall, frameless cabinets. 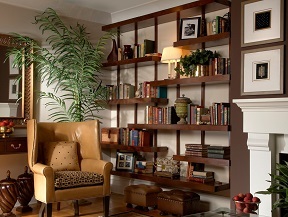 Shelves are adjustable in height and easy to view through the sides for easy access to all contents. Available for 18", 21” and 24" cabinet widths, the unit’s smooth gliding roller guide has integrated soft open and soft close. 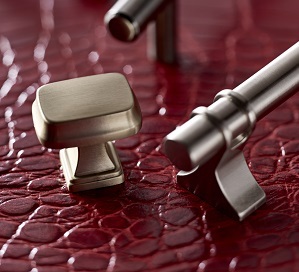 Blending the classic lines of traditional décor with modern textures and finishes, Amerock’s line of decorative hardware expands our transitional offerings while also keeping trend with sought after, traditional pieces. Decorative hardware may be a small part of your projects but we know how important it is because the beauty and final choice that’s made will have a lasting impact on the overall design. We’ve now expanded our Amerock offering to 800 select knobs, handles and pulls in multiple finishes and designs across a range of collections. Offering high quality design at an affordable price, it’s an easy choice to pick Amerock for your next project. 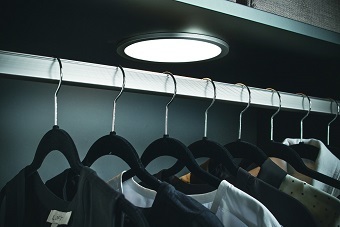 If you have our Loox LED lighting in your project, Häfele Connect is a must. Now available in the Android and iOS app stores, the Häfele Connect app allows users to easily bring smart home technology to their home and work spaces. The app allows for real-time, programmed and customizable control of all Loox LED lighting fixtures and components through an easy to navigate and intuitive interface. 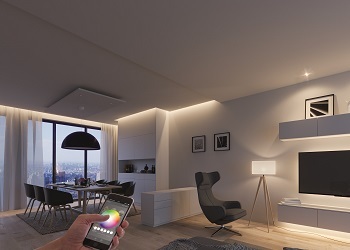 Whether on a tablet or smartphone, the Häfele Connect App will make all current and future Loox LED installations smarter and enormously more functional. Born in the barn. Perfected by Häfele. Whether for the pantry, master bath or closet, Häfele’s Slido BD100 or BD200 Flat Track Sliding System is the perfect barn door hardware set for any application. With a maximum panel weight of 220 lbs. and maximum panel height of 108 inches, it can handle a single wood sliding door with a thickness between 35-45 mm. Hardware is available in a black, brown or stainless steel finish depending on model chosen. 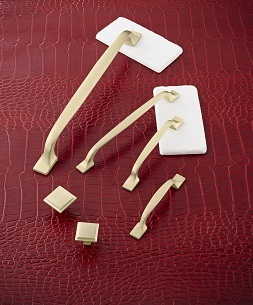 An optional, concealed soft close mechanism adds wow to any space. 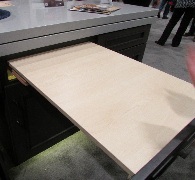 At this years’ KBIS designers can add a personal touch to their designs with our five wood finish options of Fineline™ Drawer Organization products—birch, walnut, white oak, mahogany and cherry. An elegantly designed favorite, Fineline is the premier organizational option for kitchen, bath and other spaces featuring tapered lines and a contemporary, high-end look. Be sure to make your way to booth C8916 February 19-21, 2019, to see all of this in person and everything else we have to offer. No luck or chance is required to win on your next project or design! Using lighting in projects is becoming a standard. In today’s kitchens, baths and closets, adding in-cabinet lighting, overhead lighting, lighting in drawers and throughout the space is an essential part of the most sought-after designs. The right lighting solution can make a significant difference in the functionality, overall feel and aesthetic of a space. Once your design is laid out, you may not know where to start when it comes to lighting. You have an idea of what you want, but may not be quite sure about the specifics. That’s where we come in—our Lighting Design Services will take your kitchen or closet design and create a customized lighting plan and price quote for your project. Lets jump into what that entails and what’s currently trending in lighting. The form on our website is your starting point—it’s how we know what you want. It’s been designed to gather key information and help us quickly and efficiently address the needs of your unique project. It will ask you questions such as what type of lighting you’re looking for whether it’s ribbon lighting, pucks or other options. If you’d like, we can also recommend the lighting type which best fits your project. We also ask: What type of color temperature are you looking for? Do you prefer warm or cool lighting? Will the lighting be surface- or recess-mounted? All this will allow us as lighting designers to know what you want, cuts down on turnaround time and limits the back and forth conversations asking for your needs—we want to make sure you as the project designer have what you want the first time around. Once the form is filled out, attach your dimensioned drawings and provide us with any other details you may have such as cabinetry and surface finishes. Then, submit your request. Our turnaround time is between 2-3 business days. Pretty fast, right? Considering we get between 70-100 project requests a week. We will send you a new design layout equipped with our lighting recommendations as well as a product and pricing list. From there, you tell us if you have any questions or changes. If not, we will get your order started right away. It’s just that easy. Is anything an answer? Because you can pretty much do anything you can think of and more with our Loox LED lighting. We’ve had designers use our ribbon lights to create artistic shapes, letters or other design elements. Some have even taken our color-changing RGB ribbons and paired them with clear sinks for the ultimate mood-changing design. One of the reasons we as designers love working with Loox so much is its versatility and go-anywhere functionality. When a kitchen, bath or closet remodel or new build is planned it’s rare that there’s no lighting in it. With Häfele’s Loox LED lighting we make it easy with plenty of plug and play options to choose from. We have seen a big trend with under cabinet lighting in the kitchen. Homeowners also want to be able to easily see what they have on their shelves, what’s behind cabinet doors as well as what they are prepping on their countertops. 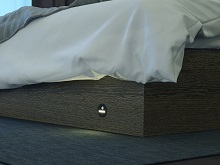 In-drawer lighting is also standard with lights that turn on as soon as the drawer is opened. Toe kick lighting is becoming more popular—this makes a bold design statement and is also great for living in place considerations. These can be added anywhere, allowing the user flexibility to have them wherever they want. 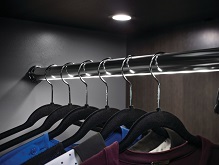 When it comes to closets, everyone wants closet rods that are lit while closet shelves are easily lit with ribbon lighting. Pucks can be used for overhang lighting or illuminating surfaces. With the all-new Häfele Connect, more and more customers are utilizing the BLE Box—the piece which makes all the smart home magic happen—so they can control the lighting all from one interface. If it’s something you've never considered, we will be sure to let you know if it would be a great fit for your project. We are always keeping up with the current trends and our products reflect that—so do the designs we send to you. There’s no need to stress when it comes to keeping your projects lit, we know what the “in” thing is that will make your customers happy. The top trends you’ll want to keep with you. It’s been quite a year. We’ve spent the past 11 months giving you the latest trends for the kitchen, closet and other spaces while shining light on what’s new with decorative hardware, connectors, locking systems, tools and designs. Every tip and trend is important, but we wanted to share our top picks from 2018. Without further adieu, here are the top 10 tips and trends from this year. 1.) When talking about connectors you have to mention the latest and greatest from Häfele—the Ixconnect Spreading Connector SC 8/25 . The humble dowel had been overdue for an upgrade and we released it this year. The Ixconnect Spreading Connector SC 8/25 is ideal for putting together small furniture and/or associated drawer boxes with no tools or glue. All you need is a few 8 mm holes to get started. Once assembled, furniture put together with the SC 8/25 won’t come apart. A definite must-have for any woodworking project with scale of production. Want to see it in action? Check out the video here . 2.) 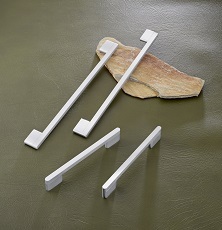 New this year for decorative hardware is edge profiles that are making their way into U.S. kitchens. Although very popular in Europe for many years, more Americans are now requesting the beveled, aluminum profiles applied to the top edge of their cabinet for easy grasping. Cleaner and sleeker lines are very popular in today’s designs. 3.) We don’t want the closet design to suffer because of the cost. 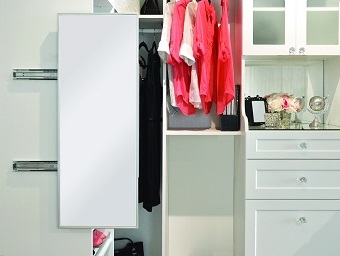 The Synergy line of closet accessories offers affordable design at a tremendous value. Everything needed to store ties, shoes, belts, pants, scarves and more. Tastefully designed, Synergy products are offered in a variety of finishes including polished chrome, matt aluminum, matt nickel and dark oil-rubbed bronze. 4.) The latest and greatest from Häfele for your next commercial project is the all-new Dialock DT 750. A fully networkable door lock solution for hotel rooms, common areas, business offices and more. Locking and unlocking is easy with Dialock. 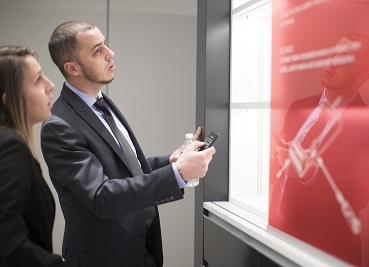 RFID technology allows touch-free activation with a Dialock key. 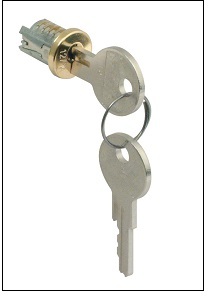 By presenting the key card to the lock, the unit is less prone to key card error and overall easier to maintain. With optional Bluetooth Low Energy (BLE) technology, users can even lock and unlock remotely through an app on their mobile device. 5.) New for the closet is technology. A Wardrobe Lift that comes down with the pull of a handle is a fantastic addition to any closet—especially when clothes are out of reach. Accessing clothes with the click of a button is even better. Trust us. The Motorized Lift stores items up and out of the way and then brings them down with a simple push of a button. 6.) Our new glue that was released in 2018 is a great addition to your projects. 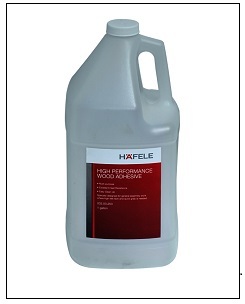 Häfele High Performance Wood Adhesive and Premium Grade PVA Adhesive are excellent, high performance glues that are heat and water resistant and work well on wood, leather, MDF, particle board and most porous materials. With good storage stability and easy clean up, these fast setting adhesives are designed for assembly use where high wet tack and quick grab is needed. 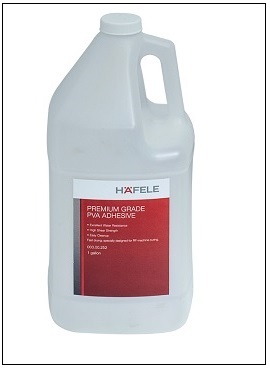 The Häfele Premium Grade PVA Adhesive can be used in external applications and is more resistant to moisture. 7.) No need to reach in the closet or anywhere for that matter. Rely on us to get to the top shelf. 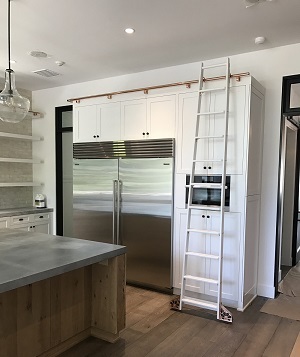 An addition of a Custom Library Ladder means having the choice of materials, styles and accents to match the look in the kitchen, closet or anywhere you see fit. Not only will it extend storage but will add style and functionality to the space. 8.) 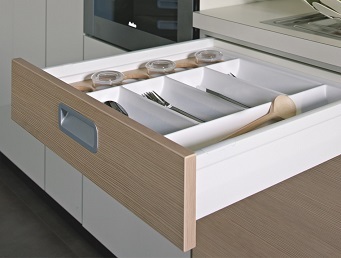 Häfele’s MX Drawer System is a designer’s preferred option for kitchens, bathrooms, offices, stores and beyond. This European-style, double walled drawer system features sleekly designed standard and deep drawers on high-quality runners. Installers will love its easy installation and tool-less adjustability. The MX’s beauty coupled with years of trouble-free performance make it a great addition to any project. 9.) 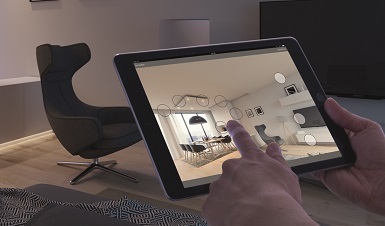 The Häfele Connect smart home was a major product release in 2018 that allows the user to control lighting anywhere in their home with the simple swipe of a finger. If the user already has Loox LED lighting in your home, the next step is easy. The Häfele Connect BLE (Bluetooth Low Energy) box is the hardware conduit between Häfele’s Loox LED Lighting System and the Häfele Connect app. With the app and BLE box in place, users can control individual lights (on/off, brightness, also the color temperature with multi white lights, and also easily change the light color with RGB lights). The system also allows the user to store custom light scenes or program time-controlled changes to the brightness and light colors. 10.) We’re attracted to a pretty finish when it comes to our hardware. Brass and gold are popular finishes but don’t look like they used to. The brass and gold knobs and pulls now have a satin or matt finish to give them a softer look. Matt black is also growing in popularity. Stainless steel continues to be popular and those who are moving away from zinc material prefer a solid brass or bronze material at a higher price point—they want the real thing. We can’t wait to see what 2019 has in store for our industry. When it comes to what’s new, Häfele will always keep you in the know. The right connector for every project. Something you can rely on. Every project or design gives you a reason to feel connected. Whether it’s the unique concept or something you’re just proud of. We also want you to have the right tools so the project is durable and something you can rely on—that’s where our connectors come into play. 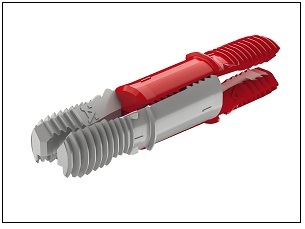 Our wide range of connectors is something you can use for any project size, scale or scope. A few words to describe them would be reliable and easy-to-use. We’re here to make your work easier and these one-of-a-kind connectors will be sure to give you the fit and functionality you need. The humble dowel has been overdue for an upgrade and boy, do we have one for you. The Ixconnect Spreading Connector SC 8/25 is ideal for putting together small furniture and/or associated drawer boxes with no tools or glue. All you need is a few 8 mm holes to get started. Once assembled, furniture put together with the SC 8/25 won’t come apart. A definite must-have for any woodworking project with scale of production. Three options are available in one system for your connections and appliance angles with the Lamello P-System. The Clamex for cabinets, Divario for shelves and Tenso for biscuits are flexible, simple-to-use connectors which will make your next project a breeze. The versatile range of P-System fittings feature form-locking anchorage that doesn’t require adhesives or screws. These highly practical, innovative components are simple to install in just a few minutes. Pair the hardware with the appropriate Lamello Zeta P2 biscuit joiner for the ultimate assembly system. The Häfele Minifix® is one of our inventions that’s been around for many years and is still used throughout the world today. 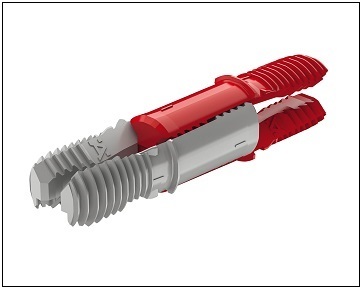 The Minifix family of connectors give you a wide range to choose from including zinc die-cast and plastic cams available in a variety of colors and finishes, with or without flanged rims. Basically, for every application, there’s a suitable Minifix cam. Save time on furniture assembly with Ixconnect Tab 15 Shelf Connector . Tools won’t be necessary—with a drill hole diameter of only 15 mm, the Tab 15 is simply pressed into the shelf manually for a sturdy, reliable connection. 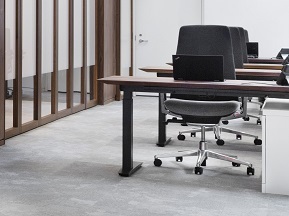 Thanks to a discreet connection, the Tab 15 significantly enhances the appearance of furniture. 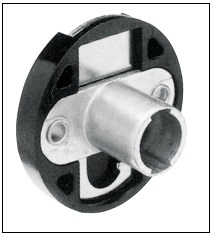 Use of this reliable product means fewer parts and mistakes during installation. Connect panels with ease with Button-fix . 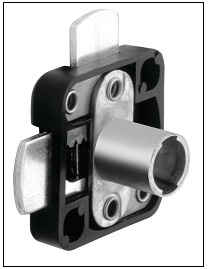 Ideal for applications where strength and security is paramount, this simple connection engages the buttons in the connector and slides the panel down by 15 mm until the Button-fix gives an audible “click.” These fittings are great for any project connecting parallel panels, 90° panels and a flush fix for parallel panels. Choose from our wide range of connectors for your next project based off of your specific need, you won’t be disappointed. Stepping back to admire your work will all now come with a bit more peace of mind—our connectors make sure it’s something that will stand the test of time. Decorative hardware is always changing. Here’s what’s new. The final details can never overlooked. Decorative hardware is something that we all can admire and appreciate. Much thought and craftsmanship goes into making each individual knob, handle or pull because of how important it is for your projects. Let’s get you up to date on the latest trends in decorative hardware. Consumers like a clean look in their kitchen and bath. 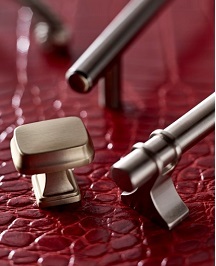 Decorative hardware that’s slim and long with not as much ornate detail is what consumers are now gravitating towards. Handles used to be smaller in size and are now exceeding 8”-12” in length. We’re seeing longer handles becoming more popular and requested a lot more than in the past. When it comes to the look of the piece, everything is edging towards contemporary—people are shying away from the more traditional knobs, handles and pulls. Decorative hardware that’s often requested doesn’t have much ornate detail. Consumers want it to blend in with their cabinetry rather than a bold color which contrasts to the cabinet finish. 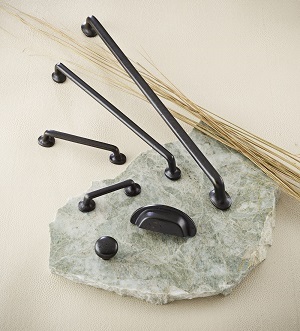 Decorative hardware has become more of a subtle accent in today’s kitchen and bath spaces. Matt blacks have come in strong this year and are used more frequently in designs. 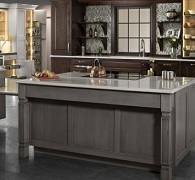 Graphites and greys are becoming more popular to pair with the emerging grey cabinetry styles. White cabinetry is still popular when paired with a soft gold or brass knob, handle or pull. Browns are trending and have more of a maple tone then in year’s past. You want your customers to feel protected always, who doesn’t? Many of today’s handles are ergonomic and ADA accessible. They’re easier to access and use because of the protection and length. Hardware with less detail can be appealing as it’s easier to maintain in terms of cleanliness. Edge profiles are making their way into U.S. kitchens. 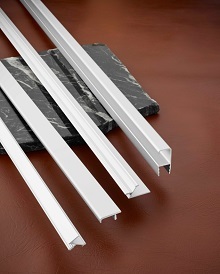 Although very popular in Europe for many years, more Americans are now requesting the beveled, aluminum profiles applied to the top edge of their cabinet for easy grasping. This allows for less wear and tear on the cabinet door and drawer edges themselves, access from any angle and cleaner, sleek lines. Learn more in our 2018 Decorative Hardware catalog with all of the latest trends for your next projects. The 2019 Decorative Hardware catalog will be out soon. We can’t wait to show you what we’ve added to our collection. We like to be different. When it comes to storage options unconventional can truly be what differentiates your project from the rest. We want to put the right products in your hands so you can innovate while adding function. Best of all? Both you and your customers will love the results. The days of your customers reaching to the back of the cabinet to find their choice of cabernet, merlot or malbec are gone with the Pull-Out Wine Tray . Now, those bottles have an organized home—simply pull out the rack, make the choice, and then push it back into the cabinet. We also have a new pull-out specifically for spices . A Wardrobe Lift that comes down with the pull of a handle is a fantastic addition to any closet—especially when clothes are out of reach. Accessing your clothes with the click of a button is even better. Trust us. The Motorized Lift stores items up and out of the way and then brings them down with a simple push of a button. Have it all. Right there. Give the kitchen the staple it needs with the Kitchen Tower . All kitchen essentials need a home to bring functionality and organization back to the kitchen again and this one-of-a-kind kitchen pull-out is a place for everything down to the last measuring cup. 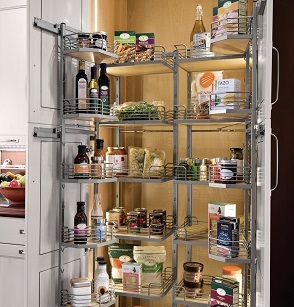 This full base unit pull-out with soft close has a compact design for efficient storage. 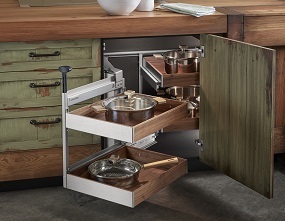 The Kitchen Tower 450 (18”) and 600 (24”) automatically glides out when the cabinet door is opened. Its removable dispenser with transparent lid is perfect for storing spices and other small items. Designated sections also mean there’s a place for knives, spoons, chopping boards and more. We have said many times we’re not a fan of acrobatics—let’s leave that to the professionals. 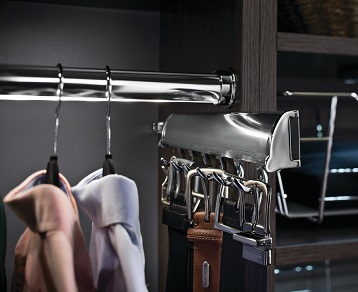 Bring stylish functionality to all the hard to reach places with the iMOVE Pull Down Unit . 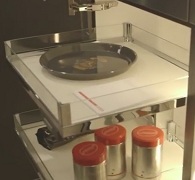 A perfect sequence of movement brings the contents of the cabinet to the user. Easy to install, the iMOVE’s stay-put functionality means the unit will stay put wherever you leave it, even when empty. If you’re looking for a rustic, European-style look for the kitchen check out our Wicker Baskets designed for both framed and frameless cabinets in various sizes. 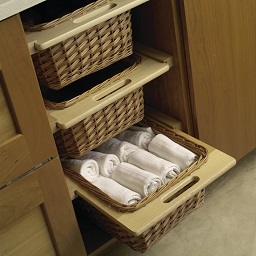 These pull-out baskets offer ample storage for practically any dry goods you may need to store. Baskets are woven over solid beech frames which slide on runners. Install them in or between two cabinets for design options as custom as could be. Each of these options allow for designers to stretch their limits—sometimes in real life—while offering an exceptional level of versatility and style. The rest is up to you. 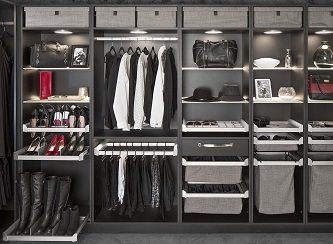 The most popular finish in closets: matt nickel. Get to know Häfele’s many lines of matt nickel closet accessories. One of the most popular finishes in the closet market today is matt nickel—we know your customers have been asking for it. It works with any style closet, marries well with any color and absolutely delivers on the promise of closet bliss. 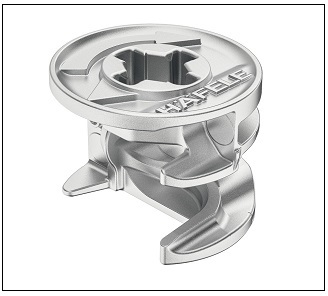 Häfele offers a wide array of products and options in matt nickel. As well as many other finishes. Lets explore all we have to offer in this trending finish. 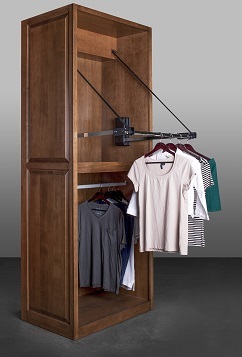 Have your customers feel connected to their closet again with the ENGAGE Closet & Storage System. This system features modular and stylish pull-out shelves and drawers which fully extend and come standard with soft close action. ENGAGE includes a wide array of hampers, dividers, shoe organizers, folding stations and storage boxes to suit any configuration. Most ENGAGE system components come pre-assembled, allowing for easy and efficient installation. Finishes include matt nickel frames with slate fabric, matt gold with beach fabric or oil-rubbed bronze with beach fabric in standard 18”, 24”, 30” and 36” widths. Whether your designs call for wardrobe tubes with end supports or a suspended, floating aesthetic, Häfele’s Signature Collection has you covered. All wardrobe tubes include a protective cap which reduces noise, prevents scratching and allows closes to glide from side-to-side. A wide array of finishes allows the Signature Collection entry into any closet size or scale and includes polished chrome, matt aluminum, matt nickel, oil-rubbed bronze and the all-new matt gold. Available finishes include polished chrome, matt aluminum, matt nickel, dark oil-rubbed bronze and the all-new matt gold. 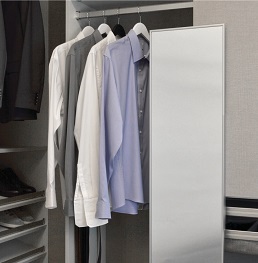 The Synergy line of closet accessories offers affordable design at a tremendous value. 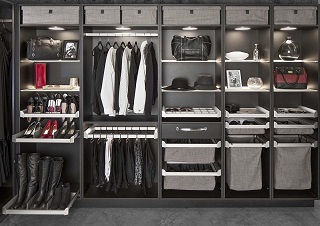 Everything one needs to store ties, shoes, belts, pants, scarves and more. Tastefully designed, Synergy products are offered in a variety of finishes including polished chrome, matt aluminum, matt nickel and dark oil-rubbed bronze. With this wide variety of choices in matt nickel to complement any design, we know this finish will continue to be popular for years to come. Peace of mind is key. 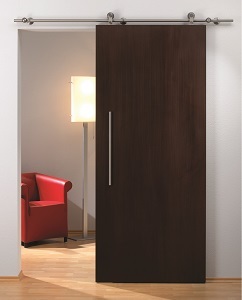 Whether for a door, cabinet or other opening Häfele has the locking solution to put your mind at ease. For any project or design for a home, office or garage, our locks will keep the things you hold most dear protected. The latest and greatest from Häfele is the all-new Dialock DT 750. A fully networkable door lock solution for hotel rooms, common areas, business offices and more. Locking and unlocking is easy with Dialock. RFID technology allows touch-free activation with a Dialock key. By presenting the key card to the lock, the unit is less prone to key card error and overall easier to maintain. With optional Bluetooth Low Energy (BLE) technology, users can even lock and unlock remotely through an app on their mobile device. Cabinet drawers and doors need protection too—after all, the smallest of things can often be the most valuable. The battery powered StealthLock® is a lock you can depend on. It operates in passage or cycle modes and is released with an RF controlled key pad transmitter. Great for office, residential or closet applications, it’s also ideal for lockers and small drawers. Deadbolt locks ensure that your things are safe. Ideal for cabinet doors as well as shallow or deep drawers, deadbolts will never spin after mounting and fully-retract, reducing snags on clothing, jewelry or anything else. Two doors, one lock. 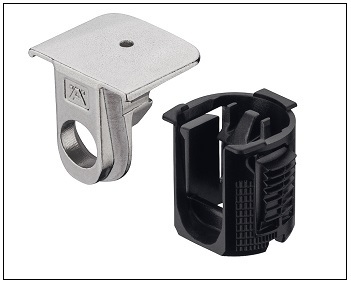 No additional catches or astragals required with select Timberline series lock options. Our full range of double door locks is sure to please. Mounted to the side of a cabinet or lock sliding doors— Push Button Locks are small, but mighty strong and our wide range gives you the perfect lock for your application. They’re not seen from the front making it difficult for unwelcome guests to find. Too many keys to count? Too difficult to keep track of? We can key your locks alike for convenience or keyed differently for added security. Either way, Häfele’s wide selection of lock cores has all you need. No matter your preference or need, we’ve got this subject under lock and key. You, your projects and your customer’s belongings are safe with us. All the tools and consumables you need to build at your best. Tools are what every shop needs. No matter your project, tools are the pieces that bring everything together—literally. Our wide variety of tools and consumables will make your shop much more functional and running at peak efficiency. 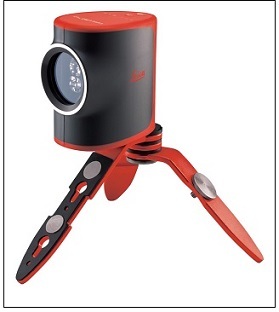 Get the perfect measurement with the Leica Lino L2 . 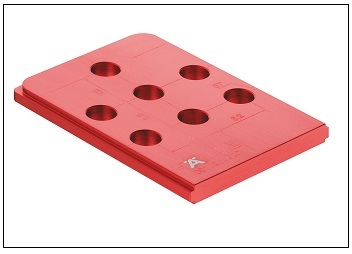 The accurate, self-leveling product is something every shop needs. 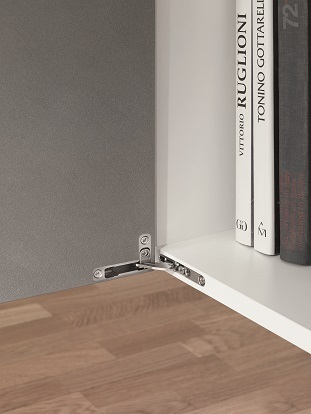 With free hands to work on your project, the Leico Lino keeps everything perfectly aligned. use where high wet tack and quick grab is needed. No matter the project, your hands are working the magic. Keep your hands protected at all times with Häfele’s variety of gloves. Astro-Grip Gloves have superior gripping power and exceptional chemical and puncture resistance if you’re working around harsh chemicals. The highly visible orange color will keep your hands in plain sight when working with others. Häfele’s Spidey Gloves are nylon, long-wearing and latex coated making them perfect for working with wood and machinery. The black, powder-free Raven Gloves are fully textured for enhanced gripping power. Derma-Lite thin, nitrile disposable gloves are economical and convenient when working with finishes, epoxies and chemicals. Originally developed for assembly work in the electronics industry, these latex-free gloves provide three times the puncture resistance of similar latex and vinyl gloves while providing increased dexterity and flexibility. With our wide variety of choices—your hands have never been more protected. Häfele’s safety products will keep you and your counterparts safe while working. A First Aid Kit for 25 people is ideal for shops and job sites. Diamondback Safety Glasses keep your eyes safe from any harsh materials or chemicals and a Cooling Towel will keep you comfortable in the hot summer heat of a warm shop. Painters Tape is an essential for your next project update or new piece that needs a paint job. 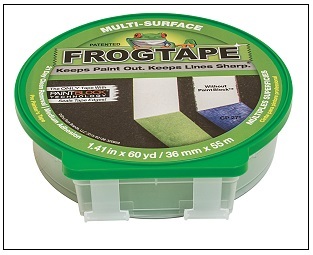 Get the perfect line on a variety of surfaces with our selection of painters tape. One machine, a sander for every project. 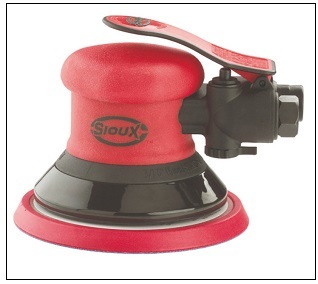 The Sioux Pneumatic Random Orbit Sander brings comfort and reduces fatigue while sanding. The one-piece motor is precision machined with counter-balance and dual vibration dampers for dramatically reduced vibration. Pair it with a wide range of grit choices for the perfect sanding job. You never want to go in blind, so to speak, when it comes to installing and aligning your projects. Having the proper drill jig is the perfect way to get things done fast and efficiently. When it comes to our products, we have the drill jig no matter the specs. Not only do you know you’re getting a high-quality product, but we’ll provide the tools to get it put together and functioning in any environment. Measure on the ground, on the ladder—anywhere you see fit. 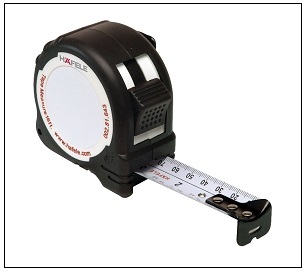 The Häfele Tape Measure allows you to not only get an exact measurement but has a built-in place for you to write down those measurements on the opposite side of the belt clip. It’s a two-in-one product you just need. You’ll also love the bulletin pencil sharpener. Been working long and hard on a project from the shop and now you need to bring it to a site to install? We have everything you need and more to safely transport your work. Whether it’s moving blankets , drying racks to keep painted items pristine or stretch wrap to keep things protected—we have it. Your projects are safe with us. Closet Potential: Showing it Off Will Be a Must. The ultimate closet refresh is within anyone’s reach. Do you remember the last time your closet was at its full potential? When you walked in and were proud of how your shirts, coats, ties and shoes were organized? It may have been a while—or possibly never. We’re here to show you the latest closet trends which will enhance your closet designs or ideas to give your own space a makeover—because why should all those people on HGTV be the only ones having fun? Either way, after we’re finished, a house tour, or should we say closet tour, is definitely a must. Rely on us to get to the top shelf. An addition of a Custom Library Ladder means having the choice of materials, styles and accents to match the closet look. Not only will it extend storage but will add style and functionality to the space. An addition of a modular, open-shelving system like the 21 C Wall Standard System will bring beauty and elegance to customized storage and bring endless possibilities. It’s now available in the widely popular gold and matte black finishes for 3’, 5’ and 8’ systems in addition to the previously available satin aluminum. Perfect for a closet, this is sure to be eye-catching in any room with a weight capacity of 150 lb., for every 32” of shelf. 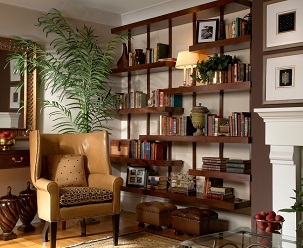 This system provides a sturdy, secure place to store valuables and display necessities. 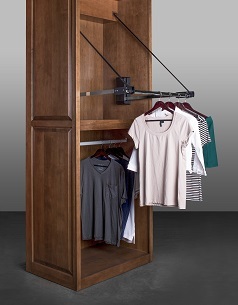 You will truly be fully engaged with your closet with the many features of the ENGAGE Closet and Storage System . 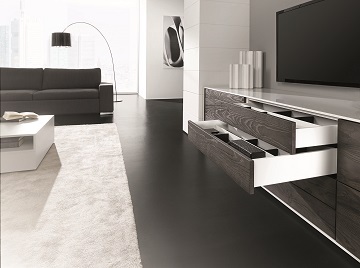 The sleek a nd stylish shelves and drawers fully extend and come standard with soft close action. ENGAGE includes a wide array of hampers, dividers, shoe organizers, folding stations and storage boxes to suit any configuration. Most ENGAGE system components come pre-assembled, allowing for easy and efficient installation. Finishes include matt nickel frames with slate fabric or oil-rubbed bronze with beach fabric in standard 18”, 24”, 30” and 36” widths. 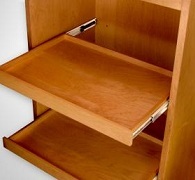 Drawers are available in both regular and tall drawer front height with matching dividers. 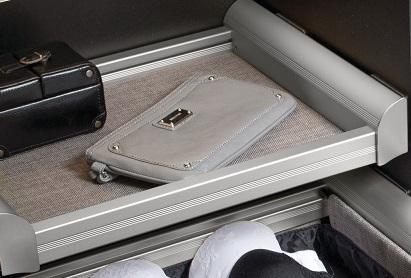 Even more personality and style can be added with drawer face adapters to conceal frames and dividers. When a closet looks this good, you won’t want to keep it behind closed doors. The Coloma Closet and Storage System is an Italian-styled, concealed closet system that makes clothes and casework appear to float―a particularly sought after style with today’s closet customers. With a stylish, sleek design, Coloma cleverly hides mounting hardware and brackets either behind shelves and drawers or within narrow, vertical mounting channels. So many choices, what are you going to do now? Feel free to give us a call at 800-423-3531, Live Chat us or email experts@hafele.us to get started on your next project. We can’t wait to see the end result. Bringing functionality to every project. What’s behind the end-result? Have you ever thought about it? We do. Whether or not something is aesthetically pleasing is important, but the functionality of the creation is what sets it apart. Hardware that allows a cabinet to open, close, twist, turn, lift up or down, is essential. So what’s trending in today’s market? 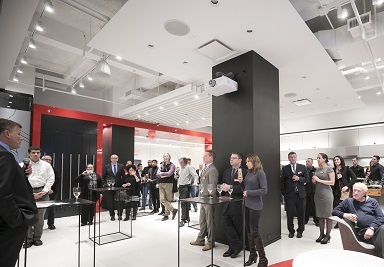 What are consumers looking for when they design a space? As one of America’s leading suppliers of functional hardware and furniture components, we have sought out and have all the inspiration you and your projects might need. We’re seeing a focus on “clean cabinetry,” meaning that decorative hardware is hidden and functional hardware is put into play. Consumers are integrating soft close or push-to-open features to add style and functionality. 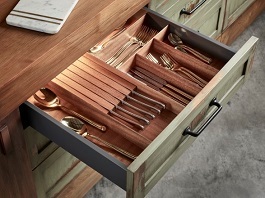 This gives consumers the opportunity to use the space more effectively with just a nudge of the drawer or trash can. With hardware on the inside of the cabinets or concealed under the drawer, it gives the entire kitchen a cleaner, modern look. A new, groundbreaking piece of hardware that delivers is the all-new Salice Air Hinge . Mortised into both the cabinet and the door it closes, this hinge delivers full functionality in a beautiful, discreet package. Fully adjustable in three directions by way of an eccentric cam, it features integrated soft close and is ideal for kitchens, bathrooms, living and bedroom furniture and display cabinets. Whether functional hardware is visible or not—the finish matters. If you haven’t heard just yet, white is pretty much the most popular color to design kitchens with these days. 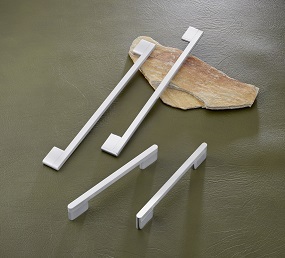 Picking up on this trend, one of the most stylish pieces of hardware is the sleekly styled, European-designed Grass Vionaro Drawer System in white . . . it’s also available in graphite and silver gray. We’re now offering all the standard drawer heights designers love to work with in every finish. For hinges, a titanium finish with a dark, bronze look, is popular allowing it to blend in with the popular dark wood finishes commonly used on cabinets. We’re seeing a shift to mechanical drawers. 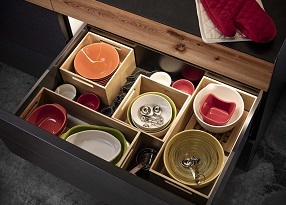 As lighting becomes a must-have within drawers and cabinetry, the simple and quick installation of mechanical add-ons such as push-to-open soft close, allows a customer to have both—and stay on budget. 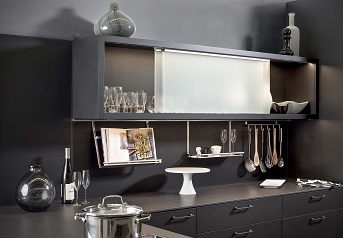 Häfele’s MX Drawer System is a designer’s preferred option for kitchens, bathrooms, offices, stores and beyond. This European-style, double walled drawer system features sleekly designed standard and deep drawers on high-quality runners. Installers will love its easy installation and tool-less adjustability. The MX’s beauty coupled with years of trouble-free performance make it a great addition to any project. The Grass Dynapro Tipmatic Soft Close has a mechanical opening for a handle-free front. The Tipmatic combines push-to-open with soft close making it the perfect addition to face frame or frameless applications. As a company that is prominent around the world, we’re always up-to-date with the trends in today’s market. We keep an eye on things so you don’t have to. Our Loox LED lighting just became "smart"
Picture this: you’re sitting on your couch with a cup of coffee while listening to The Beatles on vinyl (because any other format just doesn’t do the Fab Four justice). You pick up your iPhone and navigate to the Häfele Connect app where you adjust the lighting to a deep, dark blue to set the mood. With the Häfele Connect Smart Home you can control lighting anywhere in your home with the simple swipe of a finger. If you already have Loox LED lighting in your home, the next step is easy. The Häfele Connect BLE (Bluetooth Low Energy) box is the hardware conduit between Häfele’s Loox LED Lighting System and the Häfele Connect app. With the app and BLE box in place, users can control individual lights (on/off, brightness, also the color temperature with multi white lights, and also easily change the light color with RGB lights). The system also allows you to store custom light scenes or program time-controlled changes to the brightness and light colors. 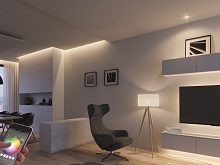 If you’re just now tapping into what Häfele’s lighting has to offer, we’re going to take you room by room to show how Loox LED lighting and the Häfele Connect Smart Home will change the functionality and personality of any space. Question: Who needs lighting in the kitchen? Answer: Everyone! Under cabinet lights are a must for today’s kitchen. 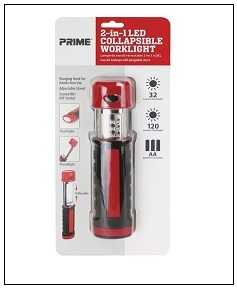 Pair that with puck lights where most of your chopping is done to give you extra light exactly where you need it. Don’t forget about the toe kick lights so you can navigate to the fridge for a midnight snack. All of these elements can be brought together and easily controlled from the Häfele Connect app. The living room is a place for family and friends to gather. Having your entertainment center and vinyl collection showcased in the perfect light is what any homeowner and discerning collector wants. With the addition of innovative switching options such as a Loox Push Button Dimmer or Loox Door Switch , you can add and control light in any scenario at any time. Or you could also tie these into your Häfele Connect app—your choice! With Loox LED lighting , the possibilities are virtually endless. Anywhere and everywhere you want light, we have a way of getting it there. Whatever your fixture, light temperature or color preference, everything is truly plug and play and it’s all synchronized with the Häfele Connect Smart Home. Every option for any design. Add a little love to your designs. Decorative hardware may be a small part of each project, but the right piece makes a world of difference. Every piece of decorative hardware has a story, an inspiration behind it, with an end user in mind—helping to set your design apart from the rest. 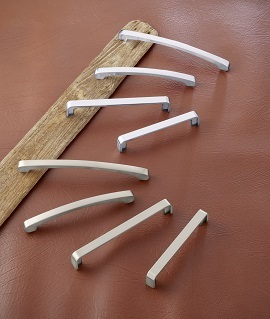 Although every design is different, certain finishes and styles of hardware are trending. We always pose the question, “What do consumers want?” Häfele is always looking to be ahead of the curve to provide you what’s in now, so you can give your customers what they want and need. What size and length is in? 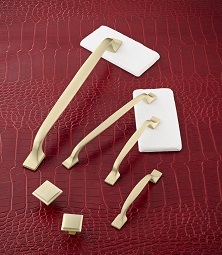 Today’s consumers are gravitating towards decorative hardware which is slim and long. Rather than reaching for the center of the cabinet to pull—having a clean, straight, long and geometric piece of hardware gives the consumer a modern look and functionality which extends beyond one center point in the drawer front or cabinet. We’re attracted to a pretty finish. Brass and gold are popular finishes but don’t look like they used to. The brass and gold knobs and pulls now have a satin or matte finish to give them a softer look. Matt black is also growing in popularity. C and J channels are a new decorative hardware option in lieu of handles and knobs because they directly integrate into cabinetry. A consumer may not want a handle or knob but can still have the same convenient reach and pull effect. C and J hardware recess into the cabinetry so fingers can get behind the channel to pull it out. 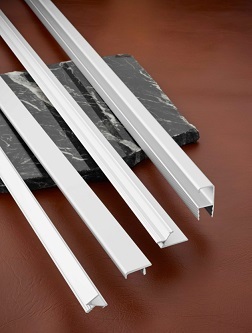 Häfele’s Passages and Venice collections offer a variety of sizes and finishes in the C and J channels. No matter the project or customer we’re sure that our extensive line of hardware will give you many options to choose from. You may have trouble making the final choice because our options are virtually endless. New Year. New you. New work space. You’re back in the office from the holiday season and ready to start the New Year off on the right track in every facet of your life—including work. You want a work space which is functional and organized but you’re not quite sure where to start. With Häfele products, you have a wide variety of organizational tools and tech-savvy systems to choose from. Think of it as office zen—no yoga required! Be cautious though: coworker jealousy may ensue. You’ll have a place for your pens, paper and every office product in between with Omni Track organizational tracks and accessories. Gone are the days of your office supplies being in disarray. This system can be used individually or configured into a panel by seamlessly overlapping the tracks above one another. Apply a variety of hooks, bins and baskets so you will never have to dig around your desk for scissors again. It’s all right there, and organized down to your last push pin. Sit or stand—the choice is yours. In order to be efficient at work you need to be comfortable at your desk. 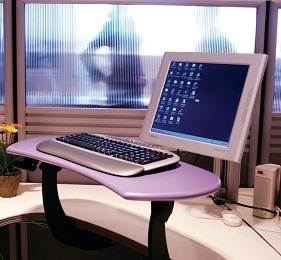 This Clever desk system can move your desk up and down with the push of a button and stay at your desired height whether it be a standing or seated position. Keep it at one position for the day or move it up and down as much as you want. Take your “employee of the year” plaque from out of your drawer or a photo of you and your loved ones and put it on display with the elegant 21C Wall Standard System. The beautiful, open-shelving system can store all of your things and is available in three finishes including silver, gold and matt black to give your office that extra edge while allowing for a personal touch. It can be frustrating when your phone is down to its last 10 percent of battery and the outlet is feet from your work station. Or worse, there’s not one in sight. 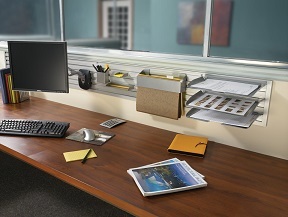 The Hide-A-Dock stays concealed inside your desk and pops up with a simple press whenever you need a charge. 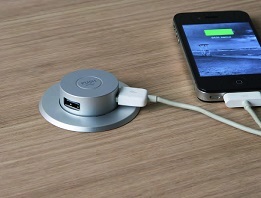 It has two outlets and two USB ports as a convenient way to power your phone or tablet. Need a different style pop-up or outlet configuration? We’ve got those too! Not only can your desk move up and down, but your keyboard can too. 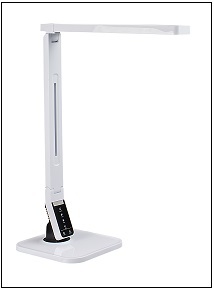 The Duet Arm is a highly stable sit-to-stand unit, which provides increased work space. This revolutionary product with its sleek design pulls out from your desk and can also tilt any which way you want to give your wrists some much needed rest. Have your office reflect how great you feel in the New Year by adding these products to your space. Not only will you feel better walking into work every day but it may, dare we say, increase your productivity. Now let’s all get to work. Twelve days of Häfele cheer. We’re shouting it loud for all to hear. The holidays are here and we want to give you products that will give you great cheer. From painter's tape to make your trimmings just right or the glue to keep your yule logs bound and secure. Häfele is a one stop shop for your gift giving needs, or maybe you want to add a few items to your own wish list. Here are 12 days of gifts to keep your holiday spirits merry and bright. Keep your Christmas sweaters hung with pride on Häfele’s Wardrobe Tubes. We have a wide collection of carefully crafted wardrobe tubing available for a variety of applications—both commercial and residential—many of which prevent scratching and give lasting beauty and functionality to any space. Start the New Year off with beauty in your closet. Whether it’s your kitchen or your toy shop that’s bustling, think of safety first. 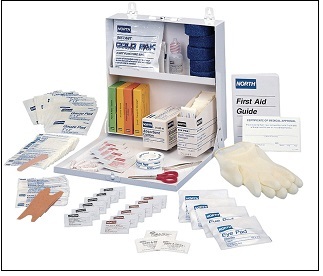 Having a First Aid Kit on hand is always a good idea. Better yet, get more than just one! With 2018 just days away, more projects will be coming your way. And with supplies for 25 people, everyone on your list can safely survive the season. From AAA to size D no matter what’s under the tree we’ve got the right battery for you. 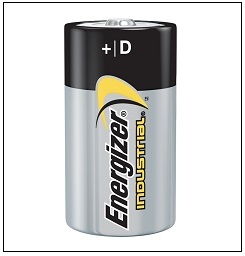 Stock up on Energizer Batteries to ensure all your new gizmos and gadgets make it into the New Year. More than just the tree is lit with the 2-in-1 LED Collapsible Work Light. Find your favorite ornament at the bottom of the box or illuminate your next sleigh ride with this nifty handheld light. Holiday projects around the house give the family time together while also checking a few things off the to-do list. 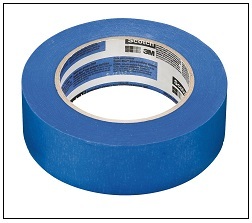 The 3M 2090 Blue Painter's Tape comes in all sizes to make sure that room you have been meaning to paint looks in tip-top shape for any other guests that may stop by. Keep your grocery lists and recipes for cookies and treats in sight and organized with the Clip Strip, Note and Paper Holder available in a variety of sizes. Looking for the perfect stocking stuffer? 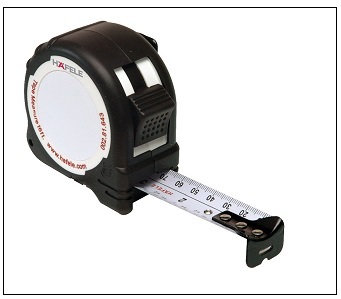 Look no further than Häfele’s Tape Measure with built-in pencil sharpener. This heavy-duty measure has an erasable notepad so you can write down your measurements while on the ladder. While visions of new projects dance in your head, don’t worry about holding together your inspired projects with Häfele’s High Performance Wood Adhesive. Now you’ve got no excuses to put together those wooden reindeer. Or a herd of them. You can never have too many glue bottles on hand around the shop. 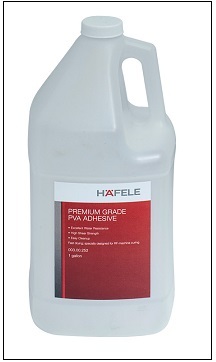 Put a set of Häfele Empty Glue Bottles on your wish list. Heck, we even use them to hold cinnamon for our egg nog. Put some new decorative hardware under the tree. 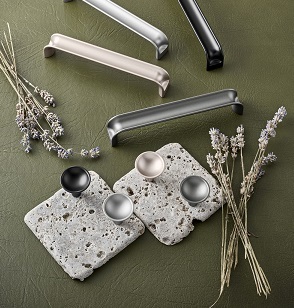 The all-new, Eclipse Collection is a transitional to contemporary selection of handles and knobs for your next kitchen, bath or casework project. 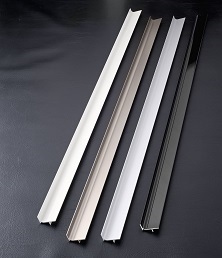 Available finishes include Black Matt, Silver Matt, Anthracite and the sublimely unique Rose Silver. You can’t go wrong with Fineline™ this holiday season. With the growing popularity of Fineline, Häfele has introduced three new wood options to the Fineline Drawer Organization line including white oak, mahogany and cherry in addition to the previously available birch and walnut. Keep eyes all aglow with this squeaky clean gift. The Portero Pull-Out for cleaning supplies fully extends when used and tucks back under the sink afterward. It’s also a detachable cleaning caddy and can be carried from room-to-room. Because sometimes the best part about having holiday guests is returning your home to normal after they depart. Now that you’re stocked with some of Häfele’s best, relax and enjoy the holidays. As we gear up for the holidays, Häfele wants to give the gift of wonderful products that make planning for family and prepping for Thanksgiving a breeze. We want to take the task of storage and design off your hands so you can prepare for your family to gather around the table. Pop-up, charge, pop-down, go—it’s that simple. Travel, family and photos galore are a big part of the holiday season. From mapping the way to Grandma’s house to entertaining the kids, it’s nice to know that with one tap, the Pop-Up USB Charger keeps your phone or tablet charged and ready to go when you are. When you’re juiced up or if screen time ends, simply push the charger back down so it’s concealed. With four different lengths of concealed attachment railing and 10 different components, we’ve got your storage needs covered without cluttering your counter top. Whether you’re the host with the most or just hoping your kitchen will survive this year, our Backsplash Railing System is here to keep everything in arm’s reach and beautifully organized. 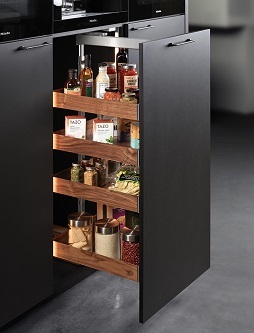 This system is an elegant way to organize your cookbooks, wine bottles, spices and more. Each component can be positioned separately and to your liking on this smooth and easy-to-install railing system. Workshop, gift-wrapping station, or leaf clean-up duty, the Omni Track has an organization system for it. The family is together. And while that often means lots of fun and laughter, it also means another set of hands for those projects you’ve been meaning to ask for help on. Whatever the project is, Omni Track will help keep your tools, craft supplies, and nearly everything in order with many helpful hooks and holders for your stuff. Choose convenient kits with themes—ranging from sports to crafts—cultivated to fit your needs, or individual pieces to customize your track. There when you need it, gone when you don’t. This Stepfix Step Stool gives you convenience and safety. Holidays mean it’s time to pull out those big pots, pans and that fancy china you haven’t seen in a while. We all know the scavenger hunt scramble through high cabinets too well, and Häfele wants to make yours easier and more obtainable with the Stepfix Step Stool . When finished the stool can be tucked away using the smooth folding mechanism. We’re extra thankful for the two storage options offered! 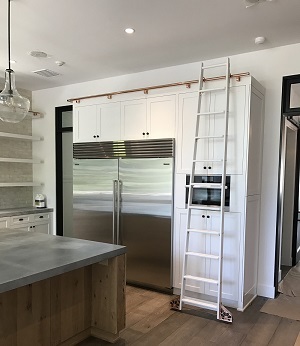 Whether you prefer our built-in rollers and optional toe-kick bracket or the hanging bracket, you will find the Häfele step stool a perfect addition to your home. Our Pull-Out Mirror can be customized to rotate out at varying degrees by simply adjusting the small bracket at the bottom. Fall fashion is upon us and as coats, jackets and cold-weather clothing find their way back into rotation, every inch of closet space matters! With the Pull-Out Mirror your closet can look just as flawless as the clothes in it without having to sacrifice function for style. 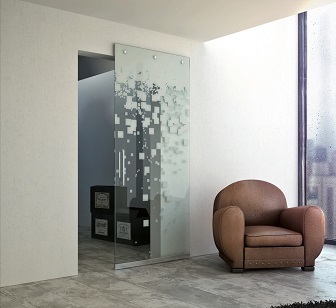 Taking up slightly more than an inch when retracted, this mirror only turns heads when you want it to. The Pull-Out Mirror with adjustable rotation comes framed in matt aluminum, nickel, or oil-rubbed bronze. The weather is cooling down and our hearts and homes are warming up. Fill your home with loved ones and never worry about feeling too crowded with these beautiful, area optimizing products. Not only will everything be in place and on display, it will also suit your style and have family members impressed with your tidiness and taste. Organizing your kitchen items can be tricky—these tools are a treat! Places for your sugar, spice and everything nice. Disorganized chaos in the pantry can give homeowners and guests quite the fright. Luckily, we have some options to help banish your junk demons—all the way down to the last spice. The iMOVE pull-down unit delivers a perfect sequence of movement bringing the cabinet contents to you. The iMOVE pull-down unit isn’t sorcery—we promise! It makes pantry items easier to access. By pulling gently on the handle, the iMOVE delivers a perfect sequence of movement bringing the contents to you. Universal design-friendly and easy to install, this product gives you precise movement and seamless mobility with an integrated soft close feature. The iMOVE is available in a variety of sizes and finishes to give you both the style and functionality you’ve been searching for. 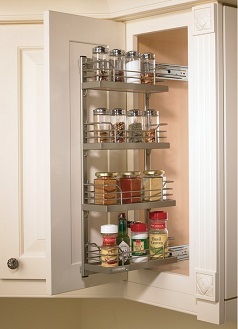 The Spice Rack stores your spices with a frame that can be used behind doors. So many spices with no place for them to be properly stored—oh, the horror. The Spice Rack stylishly stores your spices with a frame that can be used behind doors or with an optional slide for the pull-out feature. With two sizes available, it can easily accommodate a wide variety of spice jar sizes. And the best part? ALL of the spices are in view—yes, all of them. So no more blindly reaching in your cabinet where only gremlins and spices who shall not be named live. The Pantry Pull-Out provides high visibility and easy-to-reach access with a 265 lb. load capacity. The Pantry Pull-Out provides high visibility and easy-to-reach access. It's a great option for storing and bringing the tastiest Halloween candy right to you. Even the heaviest of candy apples is a breeze to store with a 265 lb. load capacity. It’s easy to install and fits in 12” and 24” cabinet widths with height adjustable trays. The synchronized soft close runner provides a stable and smooth operation. This product also exceptionally pairs well with Häfele’s Fineline™ Kitchen Accessories. 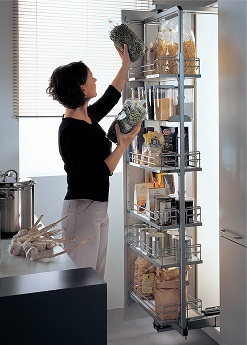 The Swing Pull-Out allows access to a tall set of storage shelves. The Swing Pull-Out is what your tall storage shelves need. 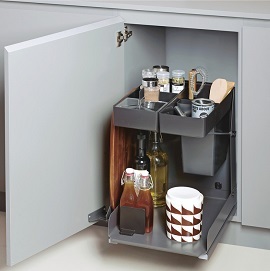 Featuring soft close technology, the Swing Pull-Out allows easy, unobstructed access to a tall set of storage shelves that adjust for practically any kitchen necessities. It swings left and right for your opening preference. The Tandem Chef’s Pantry allows for easy, total access to everything you might typically need to store in a chef’s kitchen environment. The Tandem Chef’s Pantry is the ultimate pantry storage solution for anything you might need to store—from jars filled with eye of newt to potions and brews. It allows for easy, total access to everything you might typically need to store in a chef’s kitchen environment. With the choice of three finishes to best suit your cabinet style, the Tandem is designed to fit into a face frame or frameless cabinetry while easily retrofitting into existing cabinetry. Holding up to 130 lbs. in the back and 55 lbs. in the door, all kitchen staples can be stowed in the pantry with ease. The slide slows the pull-out just before final closure, creating automatic and silent closing. Basically, this product is better than that one house in your neighborhood that gives out full-size candy bars! It’s a full moon tonight, and your pantry is no longer a fright. 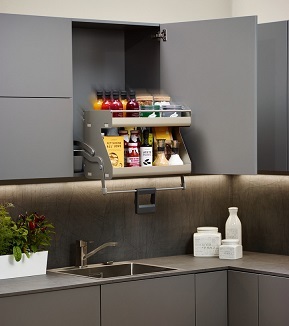 The Häfele pantry products above will make your spirits soar, because your kitchen has simply never been more organized. Those scary discordantly ghosts and goblins can stay in your past because your amazingly organized, wonderfully cool pantry solution is here to last! 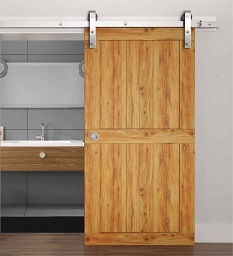 The right door hardware gives one opening a lot of possibilities. With Häfele’s sliding solutions, rooms are put to the best possible use and functionality with an added touch of individuality. Häfele offers a wide variety of door hardware options to give the style and smooth operation that you’ve been searching for. No matter the preference, we have the hardware to make the sliding door of your dreams a reality. Marketed as “The Magic Door” by our friends at Häfele Japan the SLIDO Design 80-M for glass means never having to see your door hardware. The SLIDO Design 80-M for wood and glass are exciting additions to the SLIDO product range. With the track and running gear concealed behind the door it makes doors up to 176 lbs. appear to float. The fully incorporated self and soft closing function provides safe, convenient and reliable operation at all times. The system has been developed for installations on hard floors or soft floors with the aid of an optional guide rail. The Flatec II Barn Door Hardware with a solid stainless steel track is practically maintenance free. No longer in the barn. Perfect for your home. Born in a barn. Perfected by Häfele. The Flatec II Barn Door Hardware with a solid stainless steel track is virtually maintenance free. 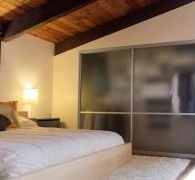 With simple installation and smooth quiet operation, your barn doors will remain simply beautiful for years. With a maximum panel weight of 220 lbs. and maximum panel height of 108 inches, the thickness is 35-45 mm for a single sliding wood door. The Hawa Telescopic is the perfect solution for wide, nearly room-sized openings. The space saving Hawa Telescopic enables simultaneous sliding of 2 to 3 doors weighing up to 176 lbs. This is the perfect solution where there is limited area for one wide door. High quality trolleys allow for easy sliding with one hand, while the toothed belts provide strong, maintenance-free operation. The Al Fresco Summit is perfect for opening your home or business to nature when you want and securely closing it when you don’t. Enjoy the salt air. Or seal it out. The Al Fresco Summit with full corrosion resistance is the ideal solution for coastal applications. For up to 16 doors (8 left and 8 right) and weights from 165-220 lbs., this strong, smooth rolling system is constructed of 316 Marine Grade Stainless Steel and features concealed channels with a choice of mortise and non-mortise hinges and hangers. The BD200 Flat Track Sliding System with Straight Hanger makes a statement with its bold design and durably built hardware. 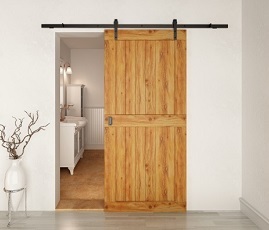 The BD200 Flat Track Sliding System with Straight Hanger is one of the newest additions to our barn door family. This heavy duty hardware will hold one door weighing up to 220 lbs. and a door thickness of 35-45 mm. What’s not to love? 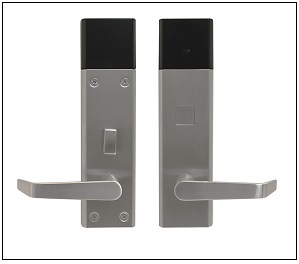 This maintenance free hardware has simple installation with stainless steel components. Despite the heavy door that it can hold, the BD200 hardware will provide smooth, quiet operation reliably for as long as you need. Hardware is available in your choice of matt stainless steel, black or brown finishes. No matter your preference, we have the hardware to seamlessly slide the perfect door into your home. So take your pick. Rejoice—fall is almost here! Boots, jeans, comfy sweaters, scarves—and don’t even get us started on Pumpkin Spice lattes! Maybe we are getting a little bit ahead of ourselves but soon enough summer clothing will be put in storage and clothing for cooler days will be pulled out. Before the wardrobe gets a refresh, the closet may need the same. The ENGAGE Pull-Out Shelf includes full extension soft close slides and is easily reconfigured to meet your storage needs. Using pull-out shelves can keep stuff concealed, clean and organized. 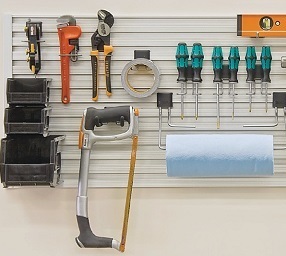 The ENGAGE Pull-Out Shelf can be used for a variety of organizational needs. When used as a jewelry shelf, it tucks under a fixed shelf and occupies a minimal amount of space. Grid dividers can give customizable areas specifically sized for jewelry, ties, glasses, socks and more. It can also be used for jeans, shoes, handbags and shirts. A simple insert even turns it into a folding station. A clutter free space is perfect for folding before putting things away in the closet. 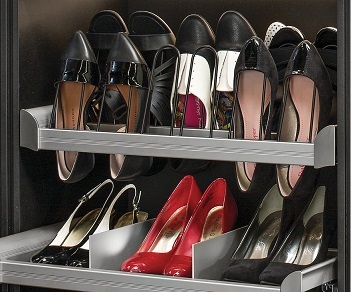 The ENGAGE Pull-Out Shoe Organizer makes shoes easy to access. Shoes are a part of our wardrobe many of us hold near and dear to our hearts. 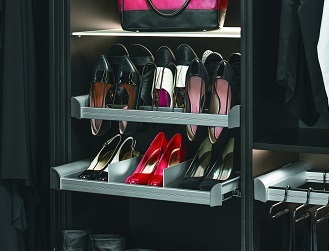 And the ENGAGE Pull-Out Shoe Organizer is a perfect solution to make shoes organized and easy to access. It holds up to 15 pairs of shoes and comes with specifically designed sandal clips to keep your favorite warm weather pair together. 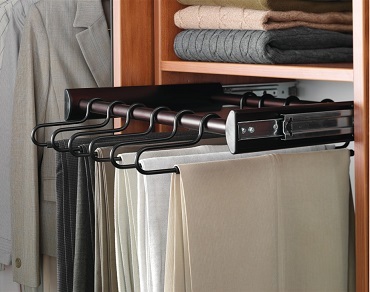 The Synergy Pants Rack Pull-Out holds up to 24 hangers. Pants for today? Easy choice. Pants can be the biggest culprit when it comes to closets not looking in tip-top shape. They never seem to hang the way we want them to and you can’t always see all of your options at once. Now you can — the Synergy Pants Rack Pull-Out makes it easy to view your pant selection with one simple motion in an efficient, organized manner. The full-extension rack holds up to 24 specifically designed hangers. The ENGAGE Pull-Out Hamper fits comfortably in the closet and can be easily removed. 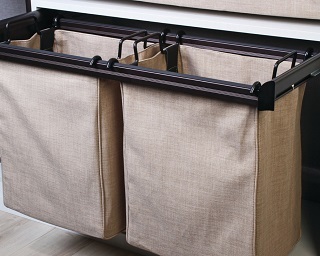 The ENGAGE Pull-Out Laundry Hamper is a deep, beautifully designed and removable hamper available in three sizes. 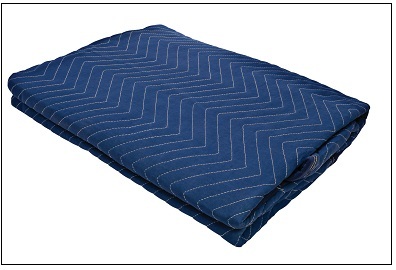 This product is perfect for keeping laundry concealed yet is easy to access when clothes are ready to be washed. And it can be easily grabbed with just one hand. 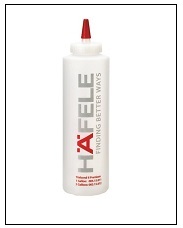 The Häfele Wardrobe Tube is durable, heavy duty and affordable. Need to add a wardrobe tube in the closet or elsewhere? We’ve got you covered. Häfele’s Wardrobe Fitting Tubes come in oval and round varieties with a chrome-plated or black PVC finish. 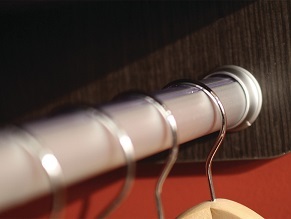 With five different lengths available, they can be adjusted to fit in any closet. These durable wardrobe tubes will hold even your heaviest coats and are affordably priced. The Synergy Pull-Out Belt Rack is an easy and convenient way to store your belts. The Synergy Pull-Out Belt Rack has us hooked. 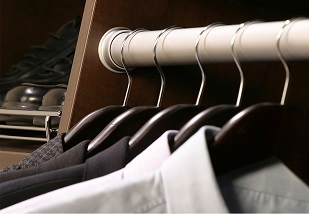 It is an easy and convenient way to store belts while concealing them inside the closet. The belt rack has a full extension slide so you can view your choices and pick out the perfect belt to go with your perfect outfit—no matter the season. You’ve got a lot going on this fall—now your closet will easily be able to keep pace. It’s been said that if you can make it in New York, you can make it anywhere. Well our all-new 4,000 sq. ft., European-inspired New York City Showroom is surely proof of success. 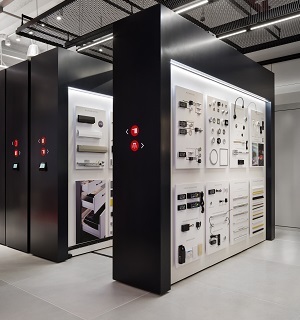 Packed with innovative hardware solutions and components—this showroom is any designer or architect’s dream all under one roof. Whether you are working on your next commercial or residential project, Häfele has everything you want and more. But, you need to see it for yourself! Here are five reasons why near or far, our showroom is a must-see when in the Big Apple. 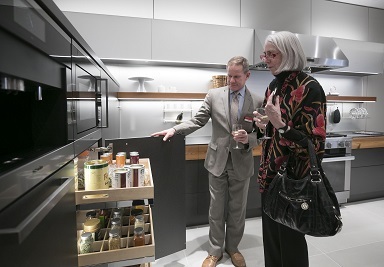 The kitchens in our NYC Showroom feature Häfele products everywhere you look and open. Kitchen bliss. The reason why everyone desires a kitchen just like this is because it’s packed with anything you would ever want or need in a kitchen. It features a wide array of products to inspire designers, architects and millworkers for their next projects such as innovative pantry pull-outs, organizational solutions and more. In cooperation with our trusted vendor partners Bright Wood Works of St. Petersburg, FL and Handmade Furniture Company of West Creek, NJ, these designs bring kitchen envy. Häfele's Innovative Product Library features many products in one space. When you walk into the showroom there is an Innovative Product Library with stacked elements that move back and forth with the touch of a button that features Häfele offerings including Loox LED lighting , MX Drawer Systems , Slido door hardware ,a bevy of decorative hardware selections and more. The great thing about this is that you can get a taste of many things Häfele has to offer in one convenient, inspired space. More than just a place to display our products, the space also accommodates various functions such as seminars and receptions. Come together, right now, over Häfele. We love that everyone can congregate for a cause over their beverage of choice and some really great hardware. The showroom allows the space to accommodate regular, day-to-day visitors then easily transforms to host a multitude of industry educational seminars, training programs, cocktail receptions, open house events and more. The outside of our NYC Showroom in Manhattan. 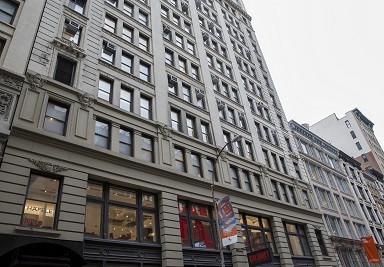 Our space is conveniently located at 20 West 22nd Street, Second Floor, New York, NY 10010—easy to get to from almost anywhere in New York City. You can tour our space and then take a walk around midtown Manhattan taking in culture, dining at nearby, world-class restaurants and taking on all the amazing shopping destinations your pocketbook can handle. Steven Crawford, Technical Showroom Sales, shows customers around the showroom. We have a friendly, hard-working staff who is ready to show you around the space as well as help you take on whatever challenges your projects pose. We are open Monday-Friday 8 a.m. to 5 p.m. Drop by, or schedule an appointment by calling 212-897-4460. Today’s consumers are looking for great products to give their home that extra edge. And now that summer is finally here, the kitchen is one of the biggest congregating spaces when hosting house parties. With the increased need for more space and functionality in the kitchen, these products are a must have for anyone seeking kitchen organization bliss. 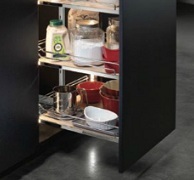 The Lemans II for blind corner cabinets gives increased space and functionality in the kitchen. With a soft and silent finish, the Lemans II has 20 percent more storage capacity than the original Lemans. Turning blind corners into opportunity is the name of the game and the Lemans I and II and Magic Corner I and II are the playing pieces. They’re all different products that have the same goal—they bring the contents of your cabinets to you. 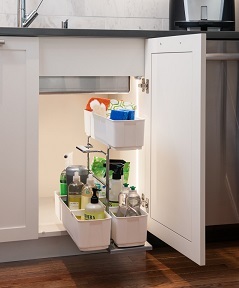 The popular blind corner pull-out units will make a kitchen more spacious and gives places to store your stuff. With a highly desired sleek finish, this product is perfect for a modern kitchen. 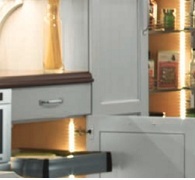 Fineline™ Kitchen Accessories bring blind corner pull-out units to the next level. 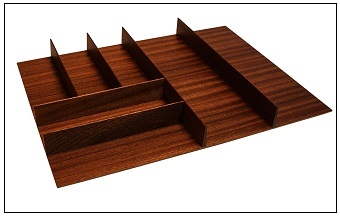 Featured is a walnut design. 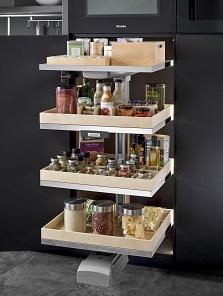 The pantry pull-out unit is even better when it has accessories. 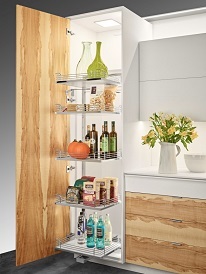 The Fineline™ Kitchen Accessories give your pantries a sleek and modern look that is so good we patented it. With a mix of warmly attractive wood and metal, the product itself is versatile with the choice of birch or walnut boxes which makes a bold design statement for any kitchen. Available metal finishes include stainless steel, silver and champagne to complete the look. Featured is the Hailo Euro Cargo Waste Bin with an easy-to-install, clip-on frame. 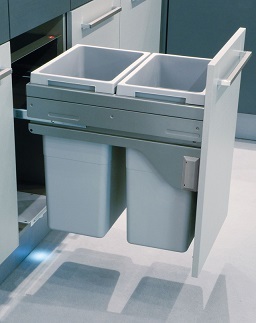 With the growing need for increased functionality, consumers want to conceal their waste bins, whenever possible. With the Hailo Euro Cargo Waste Bin it’s possible. 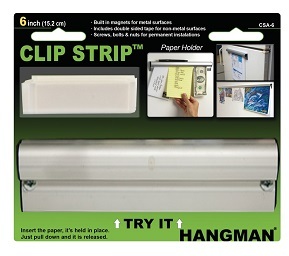 This is a product that stores your waste wherever you want it with an easy-to-install, clip-on frame. 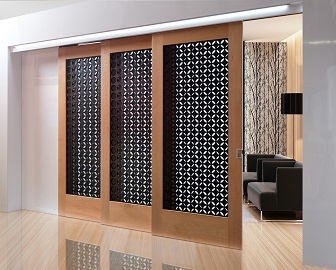 It can be installed in a face frame, inset door and frameless door applications. An added bonus is that you can double up bins, so trash and recycling is covered. 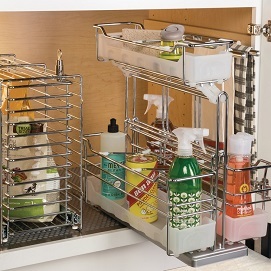 The Häfele Base Pull-Out Cleaning Caddy stores cleaning supplies and is easy to carry from room-to-room. Sometimes it can be tough to find a place for cooking products, let alone cleaning supplies! That’s why the pull-out cleaning caddy for under sinks is the perfect fit for consumers. It’s ideal for storing sponges, cleaning chemicals and can be carried from room-to-room as a detachable cleaning caddy. It also has an integrated soft close. This means that when your cleaning is done the caddy will slide easily back into place. A modern, functional, space-saving kitchen is achievable with these products. 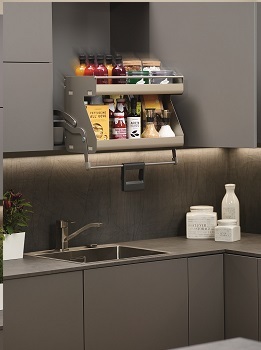 The pull-out corner units, Hailo Euro Cargo Waste Bins and cleaning caddies are just the start of the products that can give any kitchen a seamless and functional finish. And with that, you are ready for summer. Soak up the sun, and enjoy it! More kitchens today feature accent lighting such as cove, soffit, toekick, and in-cabinet illumination to add a soft layer of light during usage. 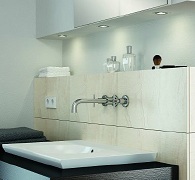 Undercabinet lighting also serves this purpose while providing functional task lighting. The latest iteration of flexible light strips and flexible silicone strips from Häfele's Loox lighting line offers brighter light while offering even more LEDs per foot. Drawer slide technology has come a long way from the under mount wood runners you may still find on an antique chest of drawers. To fill this need Häfele America Co. is excited to add the Accuride 3634 and 3634EC to our drawer slide offerings. More and more designers are creating products for the home that are safer, easier and more convenient for everyone, no matter their size, ability or age. It’s called Universal Design. Several companies, including Hafele, are unveiling new products and features that are already making a difference. The Design Tourist Karen LeBlanc takes a look! Here’s a phrase you’re going to hear a lot — UNIVERSAL DESIGN. That means that designers are creating products for the home that are safer, easier and more convenient for everyone, no matter their size, ability or age. 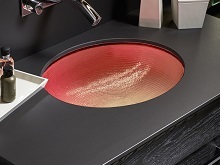 Karen LeBlanc, The Design Tourist, headed out to the world’s Kitchen and Bath Show and came back to share with Growing Bolder some of the hottest universal design places she found, including the Häfele booth. Join Karen LeBlanc in Las Vegas for 2015 Design & Construction Week, the mega-event that brings together the best-in-industry brands for nearly every space in the home. Karen explores the hottest trends including the rise of the “foodie kitchen,” ergonomic design and ways to live large in small spaces. 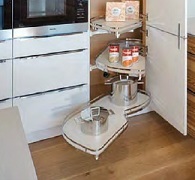 Four LeMans, blind-corner shelving systems were incorporated Into the cabinetry for easy access to hard-to-reach items. Chrome hardware on the cabinets features a modem neutral tone that combines nicely with the warmth of the wood. Mike Brewer of Hafele showcases lighting and sliding door systems for cabinets and home storage at IWF 2014. 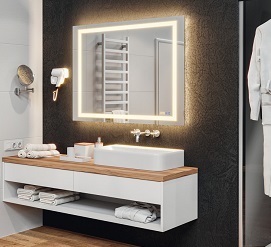 Häfele featured products include doors which retract into cabinetry like pocket doors, and Loox LED lights which turn on and off with door motion. Häfele America Co., a leading supplier of LED lighting solutions, is pleased to announce the expanded Loox family of LED lighting to provide brighter lights, advanced technology and more solutions for cabinetry lighting. Through this expansion, the 12 V system, 24 V system and 350-mA system have grown to include 21 additional products and four new drivers. Buyers of cabinets are taking a closer look at interior storage designs. 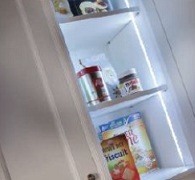 LED interior lighting packages offer benefits for cabinet cansumers, says Jason Artus, business development manager fro Luxury Custom Cabinetry Grou, Rutt HandCrafted Cabinetry and Rutt Regency. 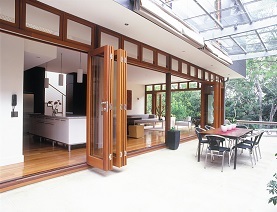 Häfele America Co. is pleased to announce the Aluflex Sliding Door System can now be ordered, customized and pre-assembled through the Häfele-to-Order (H-to-O) online service. For KBIS 2014, the simplest summary of Häfele America's hardware and component exhibit was this: Everything Was Illuminated. From drawers, to cabinets, toe kicks to closet rods, it was all lit up with LED. Also really cool and generating some buzz among designers was a tambour-style maple Rapid Pull-out Table. Häfele's Scott Markwood talks about the company's Loox 2 LED cabinet lighting system along with its other cabinet, sliding door and furniture hardware items on display at AWFS Fair. Universal Design On the Tipping Point? Perhaps it’s the growing cadre of baby boomers or the number of families trying to accommodate granny as well as young children, but in discussions about housing, the phrase “universal design” is trending.